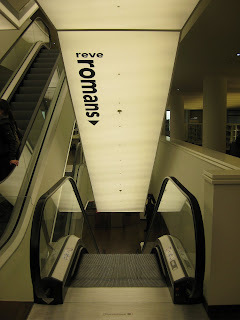 A bit of a nerd alert here... the following post deals with a place many of us haven't visited since grade school - so feel free to fast-forward if you are not a fan of the literary arts. 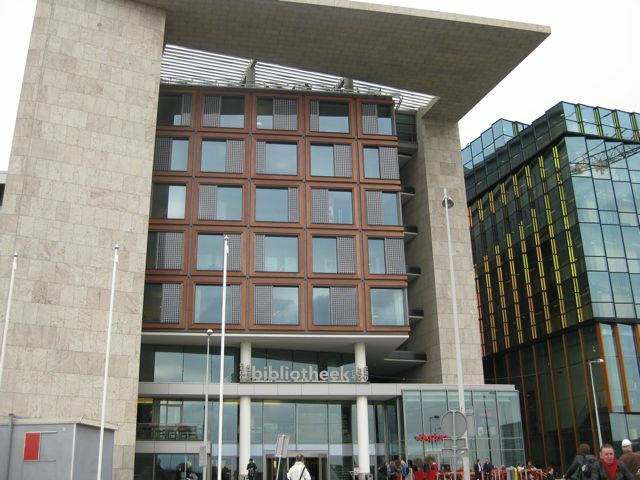 The rest of us will geek out at places like Bibliotheek Amsterdam - an architectural and bibliotheq-lical wonder located about 5 minutes walk from Amstedam's Centraal Station. It's part of what I see as the "new" Amsterdam (a post about the city's many contrasts is coming soon). "Old" Amsterdam buildings are the homes, bridges, and cobblestone streets from the past several centuries - beautiful, quaint, cramped, and the stuff that most of us see on postcards. What is less-often seen is the really cool and modern interior/exterior design that also permeates the city. 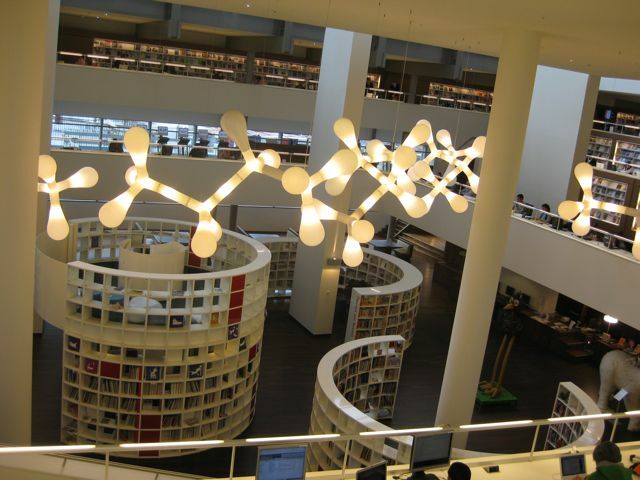 Facing a small bit of water and the entire city to the south, the main central library cost 80 million Euros and is easily the coolest library I've ever seen. The ligthing and layout - 7 floors in total - evokes an Apple store-ish feel, with the same lighting and several hundred Mac displays and terminals. While it's not a university library, you will see hundreds of college-age students poring over books and glowing from monitor screens. A regular stream of older people and some tourists run through daily as well. 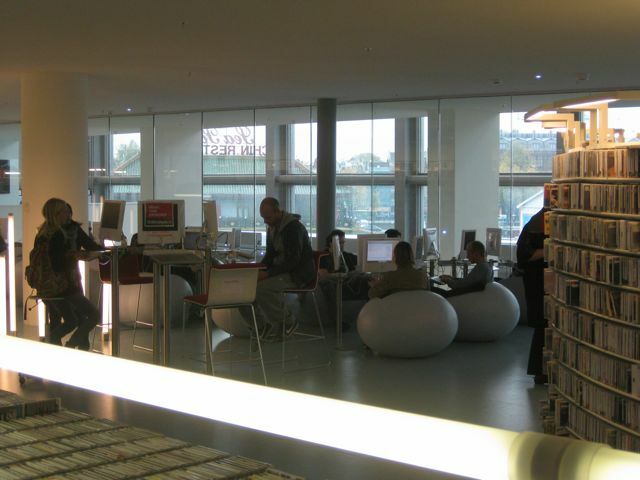 Each floor has a mix of books and magazines in Dutch, English, French and a number of other languages - although the first two make up the majority. As noted in the above link to Time Out Amsterdam, the place is decidedly light on books compared to what we normally think a central library should be - but this is probably the library of the future (pause for a slight melancholic sigh, but no sense in dwelling on the past). Less Dewey, more GUI. (Huge nerd reference there - first one who gets it wins a library membership...). 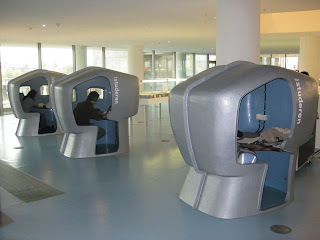 In fact, all check-ins and check-outs are done with a large computer and book bin on each level, with no librarian in sight. If they could just pipe in some of that old book smell, that would be a nice touch. You head up each level via escalator, providing a great angle to look down at the floors you just visited. You can easily lose a whole day here - flipping through books, researching things online, or just staring out the numerous floor-to-ceiling windows. And onto the seventh floor. La Place (not terribly Dutch-sounding, I must say) - a massive cafeteria that looks nicer than most of our own homes, with fresh juices, pizza made on the spot, salad bar, sandwiches, stir-frys, soups, desserts and beer and wine. (Had I gone to university here, I might still be at university here...). 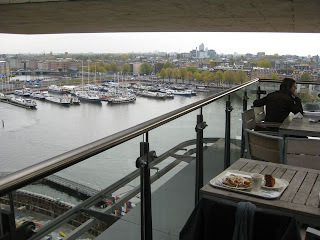 All capped off with a covered terrace outside as well, with pretty much all of Amsterdam in front of you.